Happy weekend, everyone! 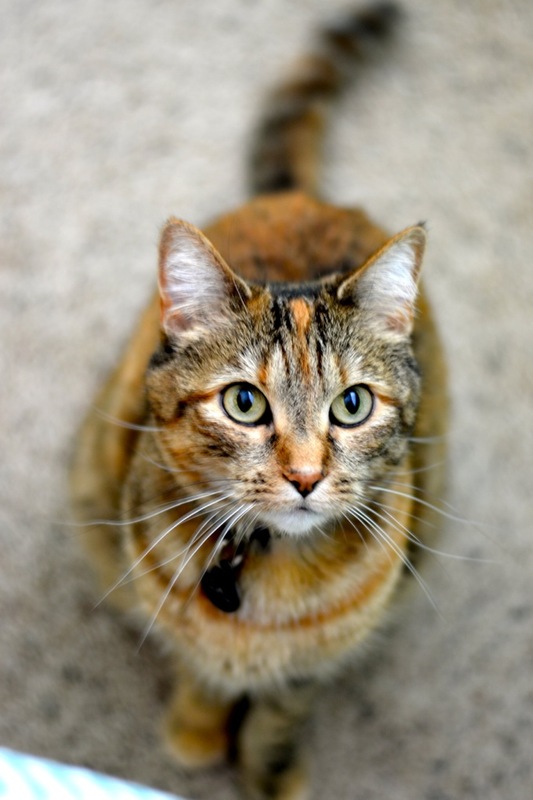 Today, since it’s Caturday, and since I’m a crazy cat lady… my favorite furry friend is back on the blog. Nick makes fun of me all the time for being a crazy cat lady. I think my cat is my child, I follow cats on Instagram, I make a beeline for the cat adoption center whenever we stop at the pet store for food, and recently I’ve even started volunteering at a cat shelter. Hey, I need my kitten fix! Thankfully the military gives us a pet limit and they’ll only move two if we ever have to go overseas. Since I can’t imagine ever having to leave a pet behind, we’ve stuck to two. Otherwise… I’d have a really hard time saying no to all the cute cats and kittens at the shelter. I think Cali likes being an only cat though, so it’s probably a good thing. She likes to get all the attention. I’m kind of proud of being a crazy cat lady, though. And the other night I may have taken my crazy cat lady tendencies to an all-time high. 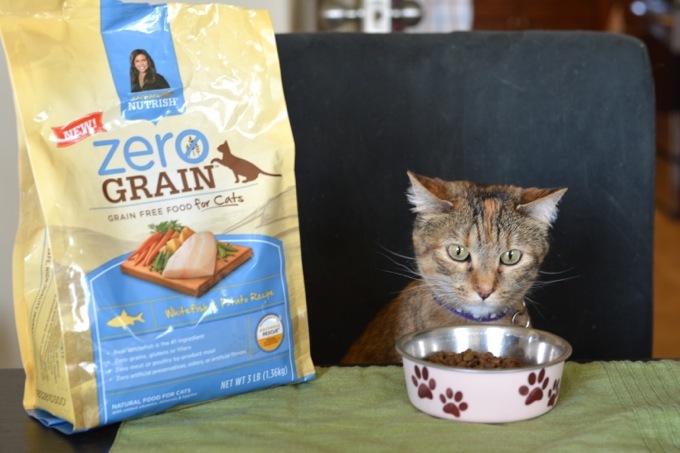 Cali has been eating Rachael Ray’s Nutrish Zero Grain Whitefish & Potato food. Rachael believes (and I agree!) mealtime is better when you share it with someone you love, so she’s created some Chef Tails recipes— human food inspired by her Nutrish recipes. Since Cali is eating the Whitefish & Potato food, I decided to create a recipe with whitefish and potatoes for us to eat with her. We wanted to share the mealtime love! Silly cat. This looks much better. Rachael Ray believes that everyone — even your dog or cat — should be able to enjoy meals made with simple natural ingredients like real meat and wholesome veggies. So I know she approves of our human meal and our kitty meal. And regardless of whether you’re a cat-lover, dog-lover or just a food-lover, you’ll definitely want to check out this recipe. Using a mandoline or very sharp knife, slice the potatoes into ⅛-inch thick slices. Brush the bottom of a 9x13-inch casserole dish or baking pan with olive oil. 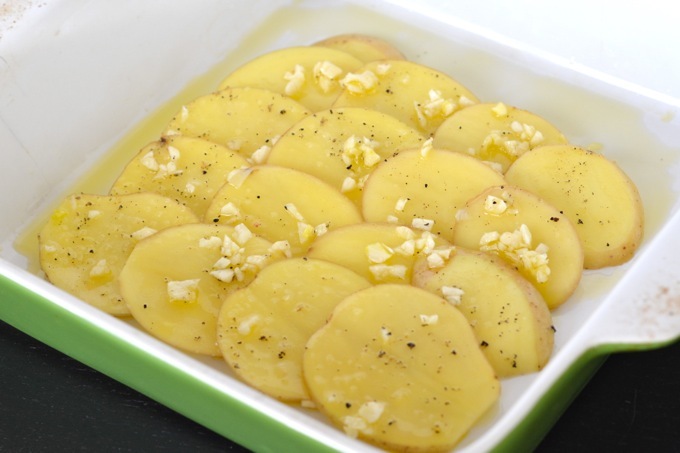 Toss the potato slices with half the garlic, 1 tbsp olive oil, and salt and pepper to taste. Spread the potatoes into two squares in the baking dish, overlapping edges (see photo below). Bake 30-35 minutes, until edges are becoming crispy. 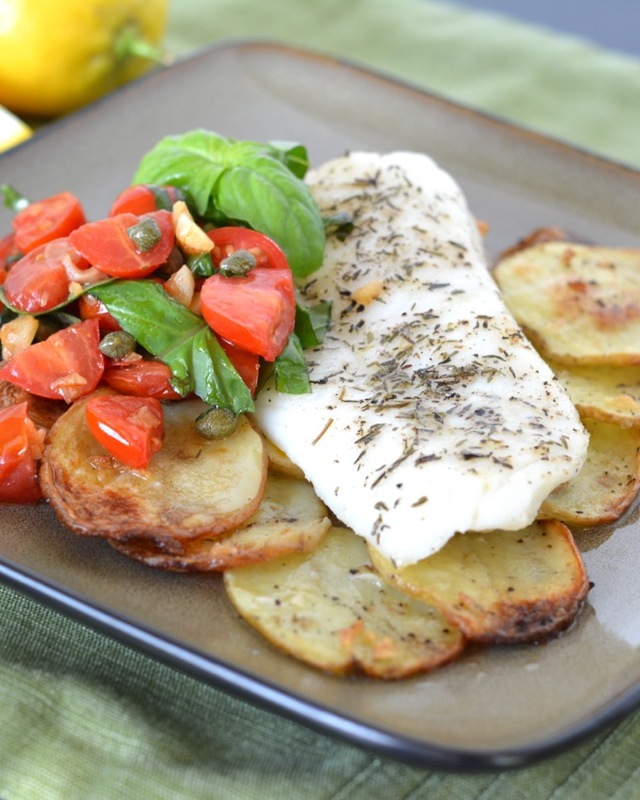 Remove from oven and place 1 fillet of cod on each square of potatoes (make sure to pat the fish dry first). Sprinkle half the thyme over each fillet, then season each with salt and pepper. Top the fish evenly with cubes of butter. Return to oven and continue baking until fish is cooked through, about 12-15 minutes. Meanwhile, heat 1 tsp olive oil in a medium skillet over medium-high heat. Add the remaining garlic and saute until fragrant, about 3 minutes. Add the tomatoes and capers and cook until heated through, about 1 more minute. Remove from heat and toss with basil. Remove the fish from the oven. Using a wide spatula, carefully transfer the potatoes and fish to a plate. Top with tomato salsa and serve immediately. This dish was so incredibly yummy. I’m always in awe when really simple, fresh ingredients combine to create such flavorful meals. The crispy garlic potatoes were out of this world and the acidity and salt of the tomatoes and capers went perfectly with the fish. The fresh basil took it all to the next level. This was such an easy dish yet came out so impressively! I really loved it and loved sharing a meal with my little kitty. If you want to stay up to date with all the latest Nutrish happenings, be sure to follow them on Facebook, Twitter and Instagram! 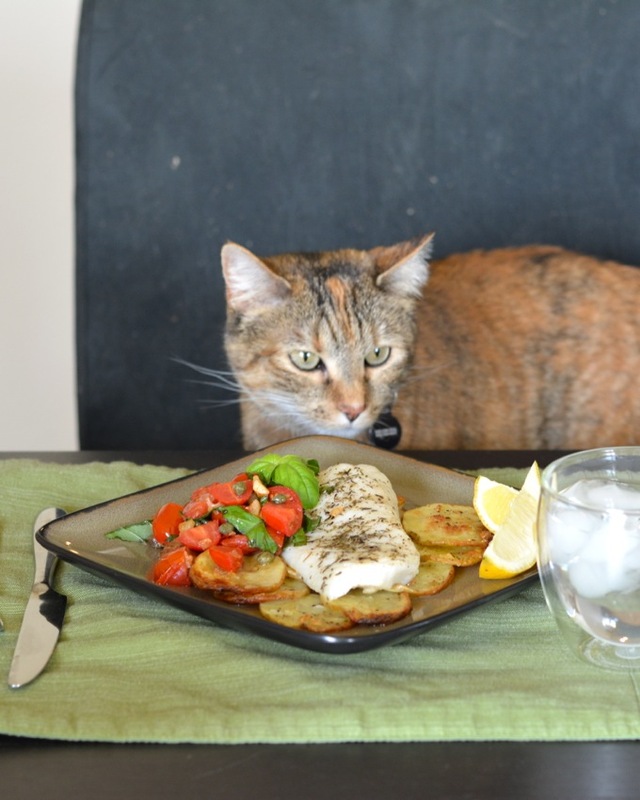 And this meal sounds purr-fect — fresh, light, and full of flavor. I love the sound of those crispy potatoes! Hehe, thanks Marcie! It was really yummy… the potatoes came out FANTASTICALLY. Definitely cooking them again that way! We don’t have any cats, but there are a few stray cats around our ranch that I spy every now and then. I think they’re getting all their food from the mice in the barn, haha! This baked cod looks delicious! Barn cats are better than barn mice, for sure!! We found a mouse in our garden this weekend so I rushed outside with the cat but didn’t get there before it took off. Eeeeesh, I hate the thought of little creepy crawlies out there!